More 3D 360 Video Samples from Vuze Camera! You can now see several more 3D 360 videos from the Vuze Camera, the first affordable 360 3D for consumers. YouTube: Just check out their YouTube channel. You’ll get the 360-degree effect (with the right browser), but it’s not going to be 3D. Make sure to choose the highest resolution for best results. VRideo: If you want to see the 360 videos in 3D, you need the VRideo app. Look for the Vuze2015 channel. As of this time, are 15 videos and counting. 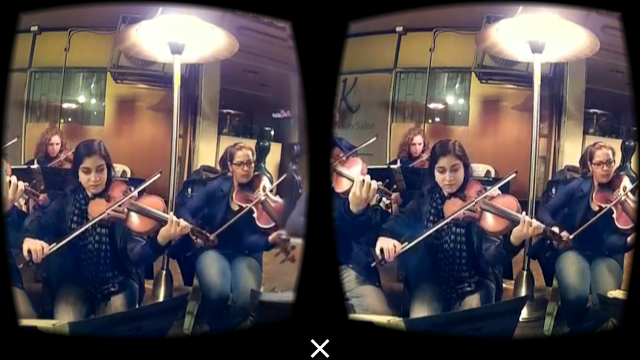 To watch the videos in 3D, you need to click on the cardboard view (“eye” icon). The screenshot above shows the 3D view, which is very noticeable. Please note that the samples were shot with prototype hardware and software, so they may not be as good as the final image quality. Note also that the VRideo app is limited to 2k, while the Vuze will have 4k capability. Out of all the upcoming 360 cameras, the Vuze is the one I’m most looking forward to! Pre-orders will start soon. To stay informed about Vuze and be one of the first to capture 360 3D videos, be sure to sign up on their website. To see related posts on the Vuze and other topics, click on the label/tags below (below the sharing icons), or check the tag cloud on the right side of the page.